Renault builds the Megane at its Palencia, Spain, plant. PARIS -- Renault will boost production at its Palencia, Spain factory starting in September to meet strong demand for its three-model Megane range. The French carmaker will add 200 units of daily production to the Palencia factory, boosting output of the Megane hatchback, coupe, and wagon from 1,120 cars today to 1,320 cars from September, a Renault spokesman told Automotive News Europe. 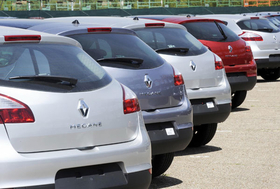 Renault plans to hire about 350 temporary workers to facilitate the production boost at Palencia. The Palencia factory employs about 3,200 workers, who manufactured just over 164,000 Megane cars during 2008. The factory has been fully dedicated to producing the new third-generation Megane models since Renault launched the hatchback in late-2008. Renault has sold about 70,000 Meganes since last November, when it launched the new hatchback. The Megane coupe launched in early-2009, and a wagon was added in June.